Discussion in 'Auto News' started by GTPNewsWire, Oct 30, 2018. This article was published by Andrew Evans (@Famine) on October 30th, 2018 in the Automotive News category. It looks good, but to save only 39 pounds seems like a waste of money and effort on Ford’s part. Dopplegagger and Dsavage27 like this. Instead of doing things the F50 way like they have been and getting a bunch of crap for it, they should have done it the F40 way they are now. Announce a set number to make speculators salivate, then make a ton more than that anyway and also a bunch of barely different limited editions. Can I order one for Gt sport? TheNuvolari, coryclifford and RaceFuchs like this. In an ideal world that is what we will have. But let's be honest: that is never going to happen. It would undermine the racing credentials of the current version, drive existing customers nuts and I don't think there is any space for a V8. At least they didn't do what Jaguar did with their halo car and promise a larger engine then deliver smaller one. A dream track day car. At least Ford has a modest wing. Most people that buy the Ford GT probably could do with a weight loss of 40 pounds themselves. So except for being a car collection item, I see no use for this Carbon Series. Woopty Doo Ford, 39lbs is weak. I can literally take 39lbs out of my basic car for free and you wouldn't even know it. Is that really a logical comparison? 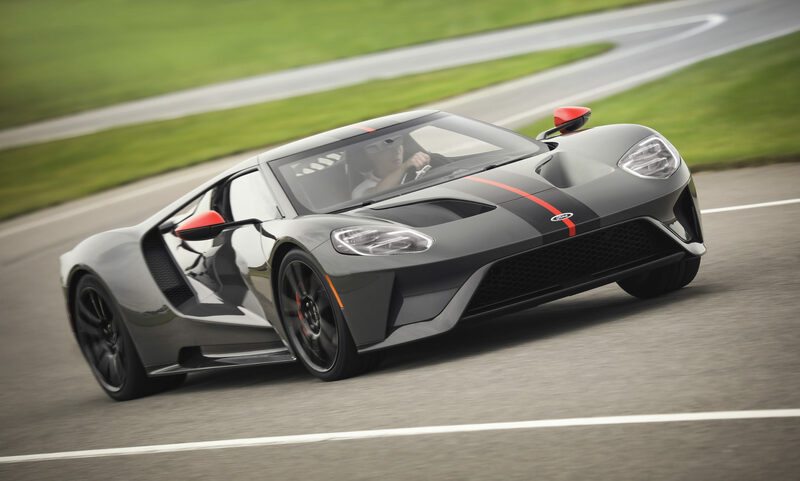 The "basic" Ford GT already has a carbon fiber monocoque and body panels with aluminum subframes and a lightweight twin turbo V6; any attempt to further decrease weight requires drastic measures, and when coupled with the desire to retain characteristics expected of the "basic" car, those measures aren't likely to yield huge losses. 39 pounds in turn for people throwing open their checkbooks to have another shot at the car sounds rather genius actually. It is a beautiful car but that word, Ford, on the front end doesn't inspire me much confidence. Yep. The collector's bubble still hasn't popped yet so I can't fault Ford for pandering directly to that segment for a quick profit. But will it catch on fire is the question. Well, not that I will ever be able to afford one. So looking at the steering wheel for extended periods of time won't happen.